Ever since the Crested Butte Mountain Bike Association re-worked parts of Trail 409 and put in the Point Lookout trail, this has become one of the better rides in the valley that most people don't ride or even know about. This ride throws a variety of terrain and interesting challenges at the rider. If you want an uphill challenge on Trail 409, great views on Point Lookout and a fun, fast, semi technical, but not overwhelming descent on Trail 409.5, then this just might be one of your favorite loops in the valley. After riding 409.5, you even have the option to add a bonus descent on Strand Hill or Strand Bonus because you're already over halfway to the top which is a featured ride in itself. Watch for motorbikes on 409.5. This is the only trail on the ride that allows motorized travel. Start by driving out Brush Creek Road to the Brush Creek trailhead parking area. It's marked on the map and will be the obvious parking area left of the road just before crossing the river. Ride west on Brush Creek Road until you get to the start of the Strand Hill doubletrack. Climb the Strand Hill doubletrack for about a mile and you'll come to an intersection for Strand Hill and Farris Creek. Stay straight on the Road toward Farris Creek. Cross a cattle gate and look for a sign just after for trail 409. Take a right here and stay right at the next intersection of 409 and 409.5. The climb starts off fairly mild on Trail 409 as you enter the trees, but soon becomes rockier and much more challenging. If it's hot out you'll appreciate the extra shade within the trees and timber here. Ever since Crested Butte Mountain Bike Association re-worked parts of the trail on this section and the Forest Service closed Trail 409 off to motorbikes, the trail is in great shape and is all rideable if you're a strong rider. Eventually the rockier section ends and becomes a much smoother and flatter singletrack winding its way through the trees and meadows. Toward the end of Trail 409 the trail starts to climb again and soon you'll be at the intersection for Point Lookout. Take a breather here. Eat, drink and take in the views as they just get better from here. Take a left onto Point Lookout and enjoy the climb here. The climb isn't very steep and is fairly gradual and mild compared to the old trail 405 that used to connect to 409. Eventually you'll make your way to the connection of Point Lookout and 409.5. Take a left here and stop to take in this unique view of the valley and prepare yourself for the fun descent on 409.5. The descent on trail 409.5 starts out fast and flowy, with a bit of loose rock mixed in. As you fly down through the upper meadows the trail will become braided with several tracks side by side from each other (due to motorbike damage). Stay in the left most track here. If you find yourself in one of the middle tracks you'll be in a rutted out bad trail. The braided trail ends right before you enter the dark timber. Once in the timber you'll be greeted right away with a washed out steep section. Take your time here to find the line. This will be the toughest section of the descent. Once past this section you'll be in for a fun, semi-technical rock and root descent fest. The trail eventually opens back up at the end and joins back up with the Farris Creek Road. Take a left here and ride back up through the cattle guard and to the intersection of Strand Hill. From here you have several options. 1. If you're really tired you can shoot back down the Strand Hill doubletrack and back to your car at the Brush Creek Parking area. 2. If you're low on energy and still want some extra descent on singletrack, head up the Strand Hill doubletrack a few tenths of a mile and head down Strand Bonus, then back to your car after you get back to Brush Creek Road. 3. If you want another awesome descent, climb up and ride Strand Hill proper. Point Lookout was completed in the fall of 2013 and the Trail 409 re-work was completed in the summer of 2014. Fast and flowy through the open sections! Beautiful aspens along the trail. 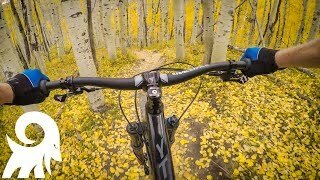 Super fun DH through aspen groves. Fall riding in Strand Hill. Beautiful aspens in the fall on Strand Hill! View from Point Lookout Trail. Smooth rolling descent at Strand.